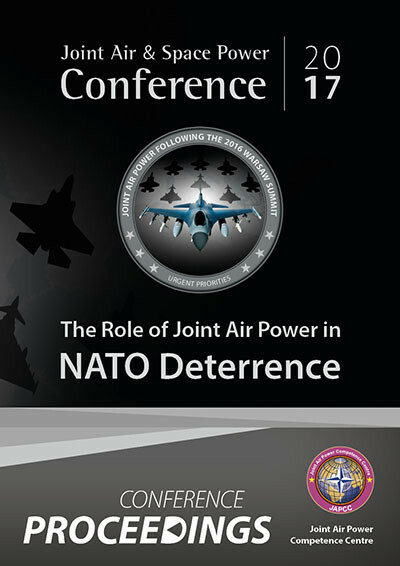 When the JAPCC planned this conference, it was never our expectation that the assembled attendees would solve any or all of the perceived challenges facing NATO with regard to this topic. Rather, by providing a multinational pool of senior and respected experts from academia, the military and industry an opportunity to debate the issues, ideas might come to light and agreement might be reached on some broad themes which can then be considered by senior leaders across the Alliance. Feedback from attendees both during and in the immediate aftermath of the conference suggests that the JAPCC has met its aims. NATO is on a journey of change. It has morphed throughout its history, successfully transitioning from its readily understood Cold War role, through a subsequent period of cooperative security which lasted until 9/11. There then followed a period of interventionist crisis management which ended abruptly in 2014 with events in Crimea. Today’s complex and demanding security environment demands a refocussing on what is perhaps the lost art of deterrence. As has been debated extensively at previous JAPCC Conferences, there was a widespread view that the theories of deterrence and coercion which used to be widely taught at staff colleges around the world were now less well understood, as NATO has bred a generation trained – and blooded – in the narrow field of counterinsurgency. It was repeatedly stressed during this Conference that to be effective, a deterrent posture must involve capabilities, credibility and communication. A key part of achieving a strong and unified Alliance posture is the rebuilding and strengthening of the ‘connective tissue’ among national and NATO command and control architectures. Air forces that are capable (against the full spectrum of potential threats, even in degraded environments), deployable, sustainable, interoperable, and highly ready can send a powerful message of deterrence if their capabilities have been understood by a potential adversary and there is an associated clear and unambiguous message of political intent regarding their use. However, potential adversaries are not always rational actors and deterrence might fail. In such a situation it is these same joint air power assets with their inherent speed, reach and flexibility that will be at the vanguard of NATO’s response. The Alliance’s centre of gravity is its cohesion. Russia, in particular, knows this and will look to foster and exploit internal rifts and tensions. In the case of Article 5 being invoked, time spent achieving political consensus would give any adversary precious time to make inroads to his campaign. Joint air power alone can counter such a risk with immediate response, if it is adequately resourced and if there are robust and politically accepted rules of engagement. There was a common understanding among attendees, that NATO must be equipped, trained and authorized to fight on ‘Day 0’. Another conclusion repeated from a recent JAPCC Conference was the need to help educate the Alliance and Partner political leadership and to help provide them with a better understanding of joint air power’s key capabilities. Participation in realistic war games (which begin at Day 0) and the observation of large-scale military exercises have important roles to play in this regard. Such experiences might also help regenerate some of the trust lost between politicians and senior military staff as a result of experiences in Iraq and Afghanistan. Initial feedback from Conference attendees indicated that the event had been a resounding success. Discussion was lively and vibrant and there was broad agreement on the areas on which NATO should be focussing if it is to enhance its ability to deter using joint air power. There are undoubtedly many improvements which are required in terms of air capabilities and the ways and means by which those capabilities are commanded, controlled, and sustained. More focus is needed on inter-domain boundary areas and multi-domain C2; potential adversary advances in cyber, space and air (hypersonics, low observables etc.) demand faster technological reactivity which in turn demands that new relationships be developed with and between industries. We must continually seek to restore and bolster the trust which our political masters place in their military leadership if difficult, robust decisions are to be taken in a timely manner and the right messages of intent are to be clearly understood by our adversaries.